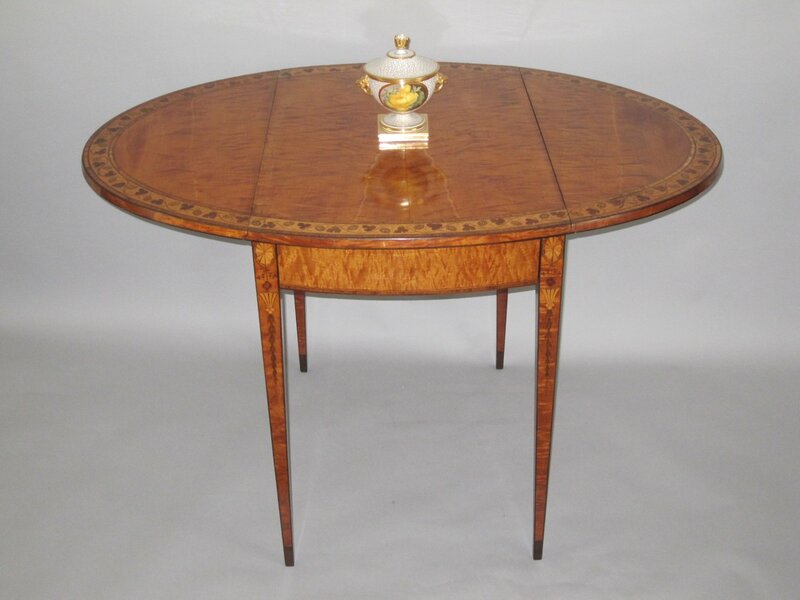 A LATE 18TH CENTURY SATINWOOD & INLAID PEMBROKE TABLE. GEORGE III, CIRCA 1780. An outstandimg table of the highest quality, elegant proportions and with a superb use of quality veneers. The oval well figured satinwood top with twin flaps with a wide inlaid band of continuous scrolling vine leaves and bunches of grapes between two narrower bands cross banded in tulipwood and with ebony & box line stringing. Over a bow front and cross banded single drawer and opposing dummy drawer, raised on four elegant square tapering legs with rosewood veneered spade feet, and inlaid with trailing harebells and flowers surmounted by paterae. Width: 44" (open) 19" (closed) Depth: 30" Height: 28"